The final lineup was assembled in 1980. Cheater took Western New York by storm with it’s incredible live shows, crazy antics and the record release of the 10″ EP “Ten Cent Love Affair. 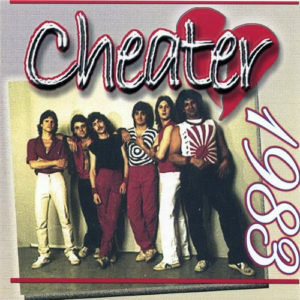 Cheater sold over 10,000 copies of this self released EP and performed 345 shows in 1981! The Album was only released in New York, Pennsylvania and Ohio – USA, yet reports have come from all over the United States and Europe from Cheater fans and Jeff Cosco fans! The band never released it’s 1983 recordings until 2005 on CD. Included are the first 4 songs from the original EP. This is classic rock at its best. Jeff Cosco, Don Mancuso (Lou Gramm Band), Chris Mawdesley, Kevin McKee, Blayne Pierce, and Ron Rocco (Black Sheep) started it all. In the later shows and recordings Jimmy Fox (Toronto) joined up. Reunion shows and avid fans have kept this band going for over 35 years!